The Dow fell 156 points. The financial stocks that fueled Wall Street last week ran dry on Monday. Bank shares dragged the market lower as traders worried that stocks, and particularly the hard-hit financials, had risen too quickly since the stock market's rally began two months ago. Some of last week's relief over the reassuring marks most banks earned during government "stress tests" evaporated Monday as investors looked ahead. Four of the banks that Washington determined were sound enough to survive a worsening in the economy said Monday they planned to issue shares to help repay loans the government doled out last fall to lubricate the nation's stalled financial system. While it's a welcome sign that banks can again turn to Wall Street to raise money by selling stock, the reality of extra shares pouring into the market weighed on financial stocks. Technology shares fared better after Microsoft Corp. moved ahead with its first-ever debt offering. The Dow Jones industrial average fell 156 points. The KBW Bank Index, which tracks 24 of the nation's largest banks, slid 7.1 percent after jumping 12.1 percent Friday. U.S. Bancorp, Capital One Financial Corp. and BB&T Corp. said they hoped to raise $1.5 billion to $2.5 billion through stock sales. Bank of New York Mellon Corp. said it would offer $1 billion in stock. Scott Fullman, director of derivatives investment strategy for WJB Capital Group in New York, noted that the Dow has risen about 30 percent since March — about twice as much as the market might do in a full year of strong gains. "To take a break here is healthy," he said. The sell-off wasn't across the board and trading was light compared with last week. That suggests many buyers were taking a break, and not that sellers were out in force. Two stocks fell for every one that rose on the New York Stock Exchange as analysts said the market was overdue for a break. Last week alone, Wells Fargo & Co. jumped 43.7 percent and JPMorgan Chase & Co. rose 19.9 percent. The Dow fell 155.88, or 1.8 percent, to 8,418.77. The Standard & Poor's 500 index fell 19.99, or 2.2 percent, to 909.24, while the Nasdaq composite index fell 7.76, or 0.5 percent, to 1,731.24. Wall Street will continue to keep watch over banks but also will be looking for insights into the health of consumers as traders search for the next catalyst that could continue to pull the market from the 12-year lows of early March. First-quarter earnings figures are expected this week from Wal-Mart Stores Inc., Macy's Inc. and other retailers and the government reports retail sales for April. Consumer spending accounts for more than two-thirds of U.S. economic activity so investors will be eager for forecasts from retailers to help determine whether the economy is stabilizing as investors have been betting the past two months. Last week, with the help of financials, the Dow gained 4.4 percent. 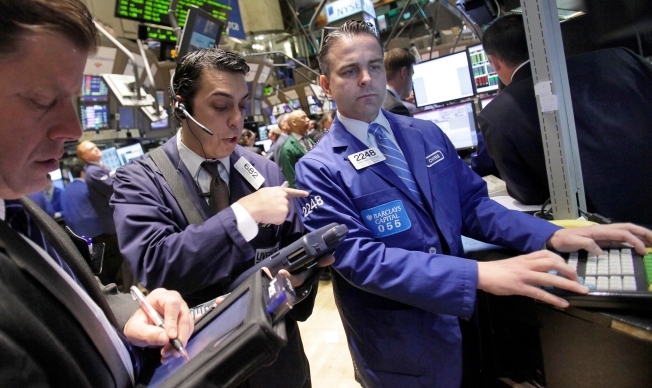 The S&P 500 index rose 5.9 percent and the Nasdaq gained 1.2 percent. Even with Monday's slide, the S&P 500 index is up 34.4 percent from early March. however, it is still down 42 percent from its high in October 2007. U.S. Bancorp fell $2.04, or 9.9 percent, to $18.50, while Capital One fell $4.24, or 13.5 percent, to $27.10. BB&T fell $1.99, or 7.6 percent, to $24.34. KeyCorp, which is one of the 10 big banks the government said has to raise more capital to protect against possible loan losses, also said it would offer up to $750 million of its shares. Key fell 69 cents, or 9.9 percent, to $6.28. Microsoft didn't say how much it hopes to raise in its offering, but in September the company's board said the company could take on as much as $6 billion in debt. The software maker, which has more than $25 billion in cash, said it plans to use the money for working capital. The stock slipped 10 cents to $19.32. "When Microsoft comes in and does a deal I think it's a vote of confidence in technology," said Nick Kalivas, vice president of financial research at MF Global in Chicago. He noted that the money it raises could allow Microsoft to go on a shopping spree to acquire attractive technology companies. Dish Network jumped $2.61, or 17 percent, to $17.92 after the company said its first-quarter profit rose 21 percent as revenue climbed partly on equipment sales. Energy stocks fell as light, sweet crude slipped 13 cents to $58.50 per barrel. Chevron Texaco fell $2.38, or 3.4 percent, to $68, while Occidental Petroleum Corp. fell $2.44, or 3.7 percent, to $62.88. Some analysts say the rally is doomed to collapse because investors are becoming too quick to declare that the economy's problems are receding. Christian Bendixen, director of technical research at Bay Crest Partners LLC in New York, said the economy remains troubled beyond what many analysts concede and that he expects the market will tumble again and perhaps breach the lowest levels of early March. "It's time to be a little more defensive," he said, pointing to areas like consumer staples, health care and energy stocks. Bond prices mostly rose. The yield on the benchmark 10-year Treasury note fell to 3.17 percent from 3.29 percent late Friday. Volume on the NYSE came to 1.5 billion shares. Overseas, Britain's FTSE 100 fell 0.6 percent, Germany's DAX index lost 1 percent, and France's CAC-40 slid 1.9 percent. Japan's Nikkei stock average rose 0.2 percent.